After spending the past eight seasons as the head coach at Skidmore College, Jack Sandler will enter his first year with the Colby College men's lacrosse team in the 2013-14 academic year. Sandler started his coaching career in the New England Small College Athletic Conference (NESCAC) at his alma mater, Bates College. "Jack will be a great fit at Colby. He is exactly the type of person who can be successful and thrive in the rigorous academic and athletic environment we offer," said Marcella Zalot, Colby's Harold Alfond Director of Athletics. "His head coaching experience and body of work at Skidmore has prepared him very well for this next phase of his career." Sandler was the Liberty League Coach of the Year in 2007 and 2011. He led the 2011 team to a league regular season title and paced the Thoroughbreds to appearances in the conference title game in 2007 and 2010. 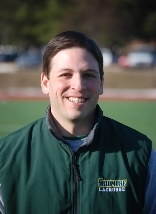 Sandler led the 2011 Skidmore team to as high as 11th in the United States Intercollegiate Lacrosse Association (USILA) poll, the top ranking in program history. "It's bittersweet for me in that I'm really excited and energized to get going with that group of guys at Colby, but it's also tough to leave this group here behind," Sandler said. Sandler was an assistant coach at Dickinson College for one year, helping the team to the Centennial Conference semifinals and the first win over rival Franklin & Marshall in 20 years. Sandler worked at Bates as assistant lacrosse coach immediately after graduating from the school in May 2002. He spent two seasons with the Bobcats under head coach Peter Lasagna, who enters his 14th year as head coach at Bates in the upcoming academic year. "Coach Lasagna is excited to have me in the league and we're still real close," Sandler said. "It will be nice to be nearby and spend some non-competitive times with him and his wife." A four-year starter, Sandler finished his career as the second all-time leading scorer in Bates history with 199 points. Sandler was the 1999 NESCAC Rookie of the Year after leading the Bobcats in scoring and earned 2002 All-NESCAC First Team honors. Sandler also is highly involved with lacrosse on the national level. He currently sits on the USILA Executive Board as an NCAA Division III representative. Sandler was elected to the post and will continue on the board until 2016. He also was part of the USILA All-America Selection Committee from 2011 to 2013 and has served on the NCAA Regional Advisory Committee from 2007 to 2010. "Being part of those committees makes me part of the process and I feel a responsibility to do that," Sandler said. Sandler also was involved in the Saratoga Springs community, formerly serving as a Co-Chair of the Executive Board for the Saratoga Partnership for Prevention and on the Coaches Council of the Saratoga Youth Lacrosse Association. A Long Island native, Sandler was a three-sport athlete in lacrosse, football, and wrestling at Friends Academy. He will start at Colby on August 20. "He is competitive, he knows how to recruit, and he is a well-rounded person with the same core values we have as an institution," Zalot said. "I am thrilled he will be leading our men's lacrosse program and look forward to working with him."